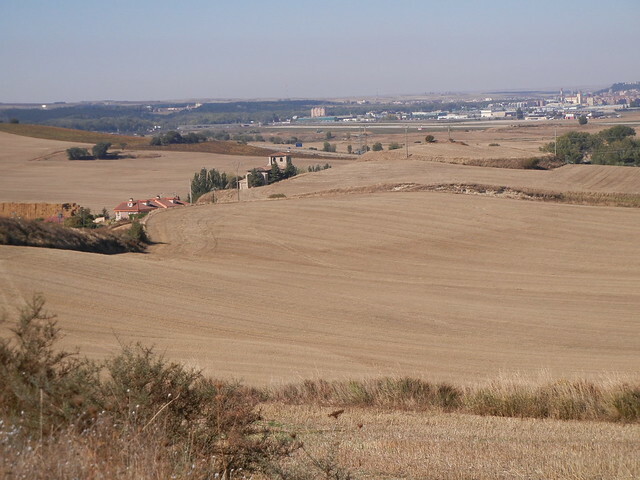 Today’s story is all about “lost” and “found.” Part of the “lost” has to do with why Dave walked 22 km from Ages to Burgos and I walked only as far as Orbaneja (10.4 km). Dave was looking for me! I’m sure he has a long explanation, so I’ll let him tell it himself. Watch for the post script in this blog post tomorrow after we meet up in Burgos. Here is my side of the story. Dave and I decided to take a peaceful alternative route as we headed towards the big city of Burgos. It was a natural path as opposed to the main route which follows a road. We were coming down the hill into the little town of Orbaneja. Dave was in the lead and I was going slowly because I was looking for a special brown rock. Why was I looking for a special brown rock? 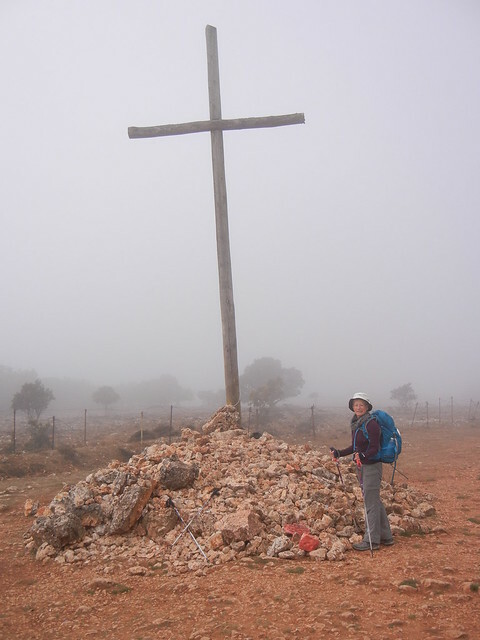 Two years ago when Tania was walking the Camino, a kind man gave her a brown rock. He told her if she needed help to ask the rock. Tania treasured the rock and took it with her to South America where it was stolen. I wanted to bring Tania a new brown rock from Spain. Actually, our day didn’t start out well either. We packed up, had breakfast at our albergue in Ages, had our boots on, and were all set to go. As Dave was about to open the door, he asked, “Where’s the camera?” Neither of us had it. We searched high and low, taking everything out of our backpacks, checking the room, and the camera just wasn’t there. We returned to the restaurant and the grocery store we visited yesterday and asked if a camera had been found. No! What now? In the meantime Dave went back to check the room for the third time. What they say about “the third time’s the charm” is true. The camera was in a corner under a bunk on the opposite side of the room to the bunk where we slept. How did it get there!? Who knows. To make a long story short, here are pictures of our day. I am here in a room with four bunk beds at the municipal albergue in Orbaneja. I am the only one in the room except for the flies. I went downstairs to the lively cafe to escape the flies and it worked. Although there were a lot of flies there, too, they seemed to favour other people better than me. Up here in my room I’m the only victim. Tonight’s experience with these awful flies taught me one thing: When I get really annoyed I resort to violence. Usually I blow or wave flies and mosquitoes away because it is bad karma to kill. Tonight I didn’t care. When I was catching up with the blog today down in that lively little cafe, I had a table to myself in the corner. The big screen TV was turned to a “futbol” (soccer) game. There was so much chatter and excitement going on, none of which I understood. It would have been distracting if they were speaking English but Spanish chatter wasn’t distracting at all. I loved it. P.S. Dave here! Here’s my side of the story. It started with Judy’s impromptu rock search. Sudden stops are not unusual. One of us will take a picture as the other carries on, then we catch up. This didn’t seem any different. I simply sat on a rock at the bottom of the hill where the paths converged for about fifteen minutes, wondering where Judy was. I then remembered there might be two ways to join the primary path and that Judy didn’t notice me turn down the hill. If that was the case, she would be ahead of me. Yes, there was a second way, so I moved myself to that intersection and looked back. No Judy! I sat on a post for about twenty minutes, then felt she could be a half-hour ahead (two kilometers). Thinking she might be a half-hour ahead, off I go. Finally I came to think that I could be the one that was ahead, but I had to reach wi-fi which would place me 45 minutes adead. Our emergency plan is email from Wee Fee in emergencies. From there we communicated and made further plans. We planned to meet the next day at our Burgus hotel. Since it was still early in the afternoon, I headed west to get closer to our hotel and find the albergue which was supposed to be 4 kms ahead rather then pay 27.5 Euros where I was. Couldn’t find it though. Ended up staying at a pension for 35 Euros instead. Bad move. In the end we met up the next morning and had a difficult time finding our hotel. Now that is all history. What we have planned to do from now on is to go back to the place where we last saw each other and wait. Fingers crossed that plan will work! Oh dear, too bad about your little adventure. Thank goodness for iPhones though and that you’re both safe – Imagine the original pilgrims just stayed lost!!! I see you’ve reached THE stone pile. It gave me goose bumps when I saw that photo. Also I’m sure your daughter will cherish her new brown stone – what a beautiful sentiment. I think the cross and pile of rocks in that picture is at Cruceiro. 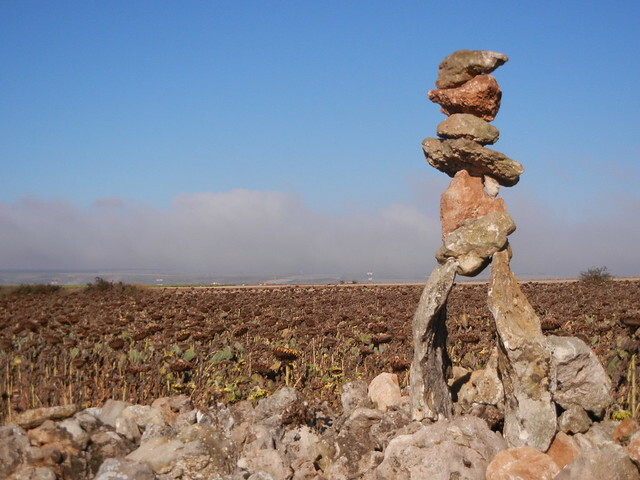 People leave rocks, notes, or something meaningful there just like they do at Cruz de Ferro. 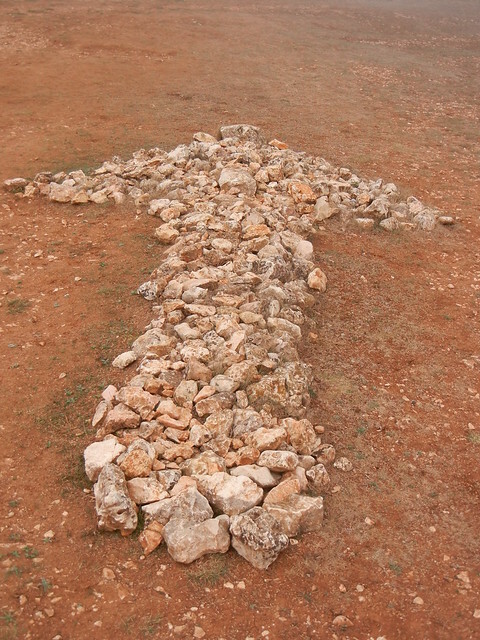 Cruz de Ferro is a much bigger pile of rock. That’s where people pause to reconnect with the purpose of their journey. 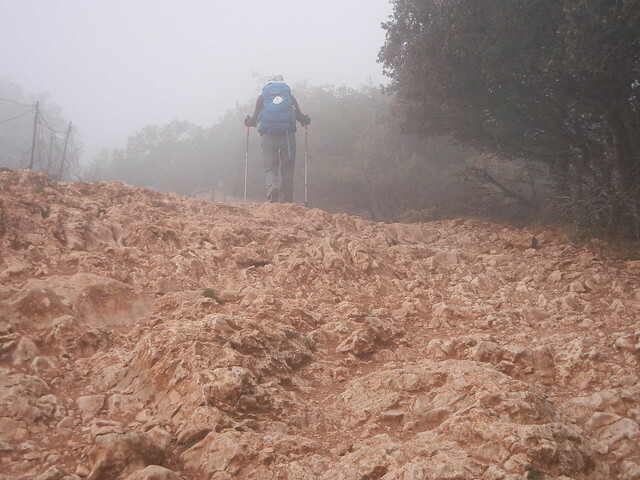 We might reach Cruz de Ferro around mid-October. That will be an amazing day! You two will have such interesting memories of your trek. Keep up the pace. Could you tell I had been drinking cervezas down in the bar when I wrote that? LOL!